If you are a health nut and you also love to indulge a bit in a tasty treat then Skinny Dipped Almonds might just be your go-to snack when you are having a snack attack! In this Skinny Dipped Almonds review, you can save with my Skinny Dipped Almonds coupon code! I just recently had a chance to sample three different flavors of Skinny Dipped Almonds. I tried out the Dark Chocolate Cocoa, Greek Yogurt Pumpkin Spice, and the Dark Chocolate Peanut Butter. Skinny Dipped Almonds come in two additional flavors as well: Dark Chocolate Espresso and Dark Chocolate Raspberry. These three bags of almonds went pretty quick in my home and we all enjoyed these flavors. Consider me a fan for life! I really do need to get my hands on the other flavors. Don’t let the name “Skinny Dipped” fool you because these almonds are certainly not lacking in flavor, in fact, each flavor that I sampled is actually bursting with flavor! Skinny Dipped Almonds are whole roasted almonds that have a hint of maple sugar, a touch of sea salt, and a skinny layer of dark chocolate on them. These are created with ethically-sourced artisan chocolate and organic ingredients. Skinny Dipped Almonds does not use any artificial colors or flavors in their snack. No funky ingredients… just real food. Looking for a protein punch? These almonds are a fantastic source of protein! 15 Skinny Dipped Almonds will give you 4 grams of protein and it is so easy to eat more than 15 of these delicious morsels. I could easily eat an entire bag in one sitting! If you need a boost in fiber, Skinny Dipped Almonds comes in at 2 grams of fiber per serving (15 almonds). The Dark Chocolate Peanut Butter reminds me so much of eating a Reeses Peanut Butter Cup. This dipped almond has a layer of dark chocolate on it and a dusting of some creamy, dreamy peanut butter. The Dark Chocolate Peanut Butter Skinny Dipped Almonds can be found online and in Target stores. They will be available at Skinny Dipped’s online store soon. The Dark Chocolate Cocoa is the nut for all of the chocolate-holics out there. This is like a double dose of chocolate. This almond is dipped in dark chocolate and has a dusting of cocoa powder on it. Last but not least, we have the Greek Yogurt Pumpkin Spice Skinny Dipped Almond. I will be flat out honest here… I am not a PSL fan but this pumpkin spice almond actually turned out to be my favorite of the bunch! This nut has a thin layer of Greek yogurt on it almond with maple sugar, sea salt, and a sprinkling of pumpkin spice. This flavor here just screams FALL! The Greek Yogurt Pumpkin Spice Skinny Dipped Almonds are limited time only and available only at select Target stores. So don’t hesitate and be sure to pick up a bag of these on your next Target trip! Nothing is perfect so read on to see what I would change. While these are very much loved and enjoyed in our household I do wish that the sugar content was a bit lower. When you nibble on 15 on these dipped nuts you come out with6 grams of sugar on the Dark Chocolate Cocoa. It’s not too shabby of a number but it would be nice if it was lower. When I snack on these I probably eat between 20-30 dipped almonds. It is very easy to go over that 15 that is considered one serving size. One other thing that I would change is that I wish they used vegan, dairy-free chocolate with the nuts. These do not fit into my paleo diet and I truly wish that they did. I am always looking for paleo snack options and these would be totally awesome for that. If you are a nut-lover and you have a passion and longing for chocolate I believe you would absolutely love these Skinny Dipped Almonds. One other thing about these that I forgot to mention is that they are a fantastic portable snack. Finding a snack that travels well easily is always a major plus so you can snack on-the-go. Skinny Dipped Almonds coupon code! So you want to give them a whirl! Now what? 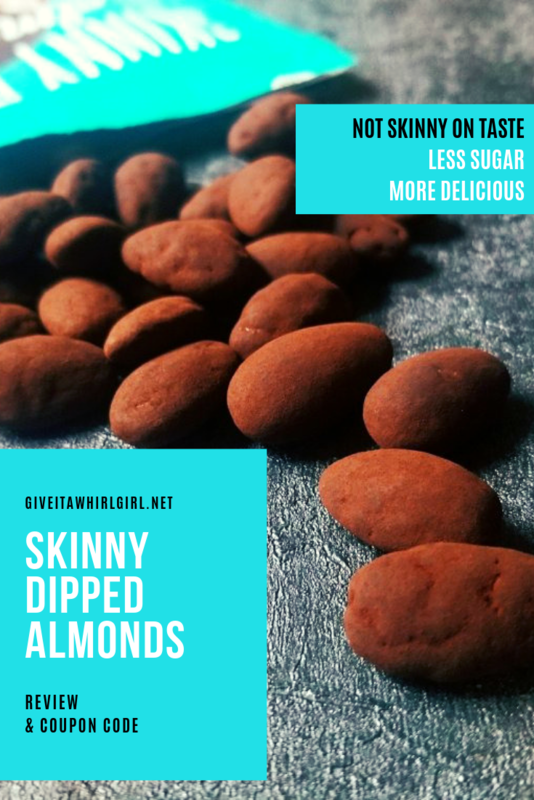 Skinny Dipped Almonds currently has free shipping on orders over $30 and here comes the great part… use my special Skinny Dipped Almonds coupon code GIVEITAWHIRL15 to save 15% on your first order of these awesome dipped almonds. Clip this coupon to save 15% off your next order at Skinny Dipped Almonds. I need those nuts now! If online shopping is not your thing and you want these right away use the handy store locator tool to find out where you can snag a bag, or two, or three! I can tell you this, some Targets do carry these. That is actually how I discovered these. I bought the raspberry flavored almonds and it was love at first bite! You can find out more about Skinny Dipped Almonds on their Facebook page or Instagram. Question Time! What flavor looks most appealing to you? Will you be ordering your first batch of these Skinny Dipped Almonds? Leave me a comment and let me know. This entry was posted in Product Reviews and tagged almonds, amazon, chocolate, cocoa, coupon, dark chocolate, discount, fiber, gluten free, glutenfree, Greek yogurt, healthy food, healthy snack, peanut butter, protein, pumpkin spice, shopping, Skinny Dipped Almonds, Target. Bookmark the permalink. I just ordered me the peanut butter ones! Can’t wait to get them!! Those pumpkin spice were definitely delicious. I will order some next! How awesome!! Happy to hear that you like them.